Our host partner in Costa Rica is Colegio Técnico Profesional de Santa Elena or Technical Professional Secondary School of Santa Elena, located in a small town in the cloud forest region of Monteverde. It is called Colegio for short, which means secondary school, and houses grades 7 through 12. This technical high school has over 400 students and 40 teachers. It is the only public secondary school in Santa Elena and is closely linked with the Santa Elena Cloud Forest Reserve. This region of Costa Rica is known for its extremely high level of biodiversity and is a place where scientists from all over the globe come to study the flora, fauna, and ecosystem of this beautiful region of Central America. In ninth grade, students at Colegio must choose a major such as agriculture, rural tourism, ecotourism, and gastronomy – all very common activities in the region, which depends greatly on tourism. Students graduate with a specialization in one such area, similar to a major at university. Organic farming, sustainable tourism, and conservation are all areas of study at Colegio. Students studying rural tourism or ecotourism have the opportunity for real hands-on learning in the forest trail on the school campus. 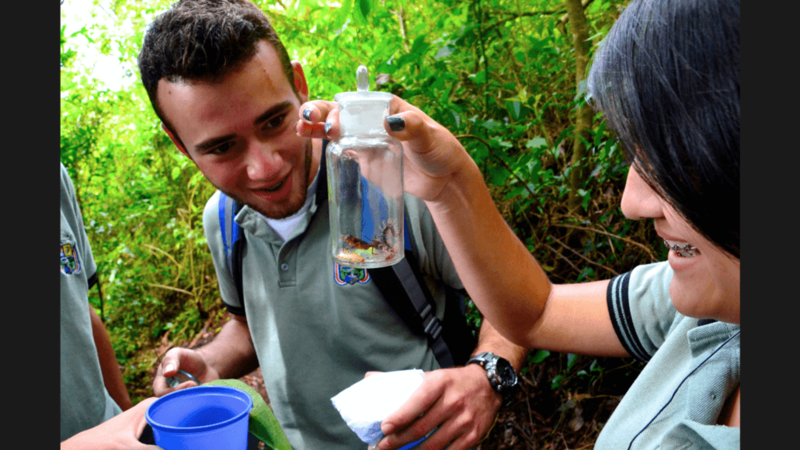 Volunteers also have the opportunity for hands-on learning through service – by working with the students on clearing and building trails in the forest, catching insects for study and identification, making signs with the names of species found (identified by their scientific name in Latin as well as in Spanish and English). The day these photos were taken, the students caught TONS of insects and worked on conserving, identifying, and learning about them.